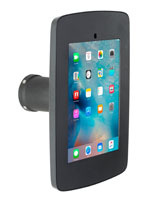 This Wall Mount IPad is Made to Last in Commercial Settings! These Tablet Accessories Accommodate the Apple® 2nd, 3rd & 4th Generation Devices! 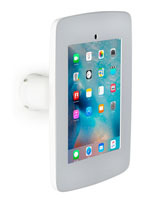 Each Wall Mount IPad has a Silver Finish! Silver tablet holder includes (2) base pieces to hide or expose the home button. 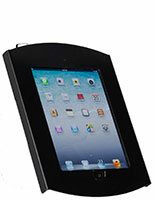 Tilting & rotating cast aluminum enclosure to position the iPad at the ideal angle. 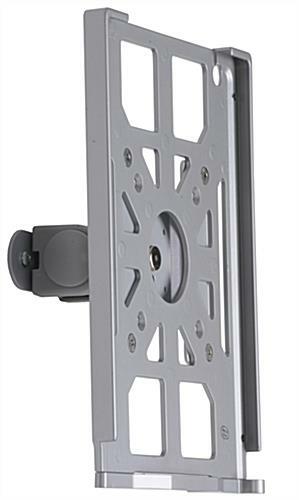 Steel constructed VESA wall bracket includes all hardware for mounting. Accommodates 2nd, 3rd & 4th generation devices. Low profile case has the camera and charging port holes open. 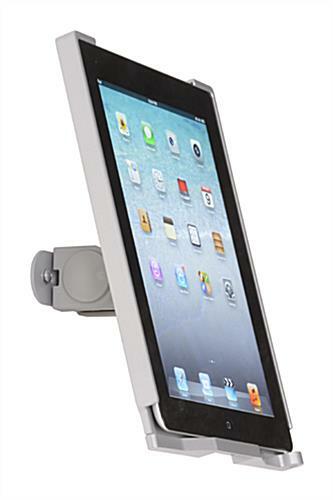 The wall mount iPad, as shown here, comes with a VESA compatible steel bracket. Any 75mm x 75mm or 100mm x 100mm VESA product can work on the bracket if users want to switch up the display. In addition, this tablet kiosk is a wall mount iPad that has a low profile enclosure for keeping the Apple® device the focal point. There are some touchscreen holders on the market that are so large and bulky, that they often take the attention away from the promotional presentation on the device. A great feature of this wall mount iPad is that the camera holes and charging port are left open to access while in use. These tablet accessories are designed to hold the Apple® 2nd, 3rd & 4th generation devices. No other size touchscreen player is guaranteed to fit in the wall mount iPad. The enclosure that is included with this retail display comes with (2) bottom pieces to secure the tablet inside the case. 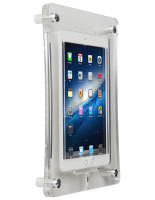 Each wall mount iPad is versatile since one base piece will keep the home button hidden and the other will expose it. The great thing about this display is that they take up very little space, but can be placed right at the average consumers eye level. 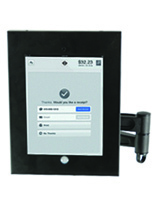 A wall mount iPad for business use, called an Apple® device kiosk, includes all the necessary hardware for mounting in a retail store. Floorstanding and countertop displays are also available, but they take up space that can better be used for merchandise. 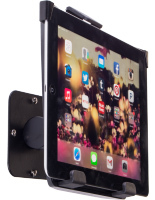 This tablet holder is a wall mount iPad that tilts and rotates so patrons can position the device at the ideal angle. Each enclosure can rotate 360° and tilt as far back and forth as the area allows. 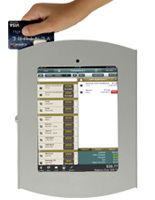 This touchscreen kiosk is a wall mount iPad that is easy to use. There are rubber tipped set screws included for creating a secure fit for the tablets without the fear of scratching the expensive devices. These Apple® accessories are economically priced to work with any size budget and can be purchased in large quantities for businesses that require the use of several units at a time. 7.5" x 14.5" x 4.8"
3.5" x 1.3" x 3.0"